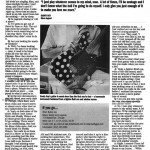 This article by Robert Loerzel originally appeared in The Daily Southtown on December 24, 2006. For years, Chicago blues fans could count on one thing happening every January — Buddy Guy would play a marathon series of concerts at his Chicago nightclub. 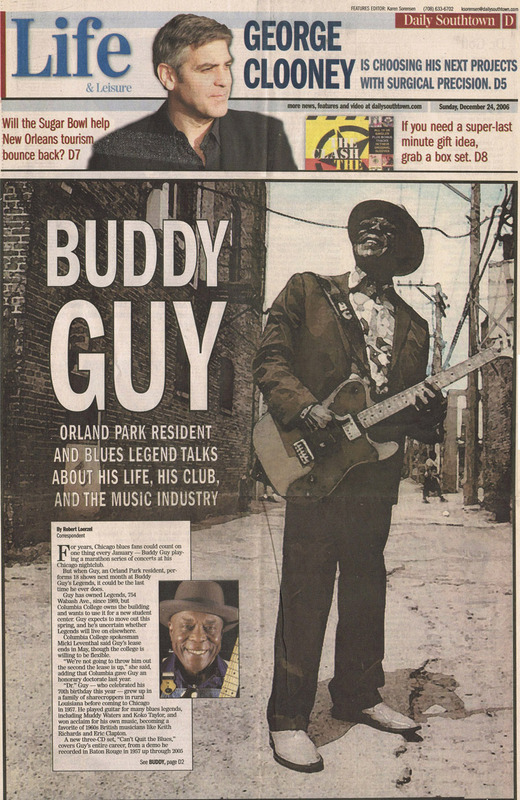 But when Guy, an Orland Park resident, performs 18 shows next month at Buddy Guy’s Legends, it could be the last time he ever does it. Columbia College spokesman Micki Leventhal said Guy’s lease ends in May, though the college is willing to be flexible. “We’re not going to throw him out the second the lease is up,” she said, adding that Columbia gave Guy an honorary doctorate last year. “Dr.” Guy — who celebrated his 70th birthday this year — grew up in a family of sharecroppers in rural Louisiana before coming to Chicago in 1957. He played guitar for many blues legends, including Muddy Waters and Koko Taylor, and won acclaim for his own music, becoming a favorite of 1960s British musicians like Keith Richards and Eric Clapton. A new three-CD set, “Can’t Quit the Blues,” covers Guy’s entire career, from a demo he recorded in Baton Rouge in 1957 up through 2005 sessions with Richards, John Mayer and Shemekia Copeland. The box set also features a DVD with the documentary “My Time After Awhile” and films of Guy performing 11 songs at various concerts between 1974 and 2004. Guy has eight children, and some of them are pursuing musical careers. His daughter Shawnna performs hip-hop; his son Michael has created beats for rapper Ludacris; and his daughter Carlise leads the NuBlu Band, which will open some of Guy’s Legends shows next month. Guy spoke by telephone earlier this month. Q: It was surprising that you wanted to do this interview early (at 9 a.m.). Most musicians like to sleep late. Q: Have you always been an early riser? A: Man, I was born on the farm. I’ve never lost that yet, man. I was having coffee at about 4:30. I always go back to sleep around 2:30 in the afternoon. Even on the road, it just works perfect — about 2½ hours in the afternoon and about four at night. It’s been like that all my life. Especially in the spring, when the birds are singing, man, and when daylight breaks, I can’t sleep, and I don’t care if I drank a bottle of wine, I wake right up. Never had an alarm clock in my life, never been late for nothing — not by sleep. Q: Is Legends closing or moving soon? A: I’ve gotta to get out of there by June or July. The college owns the property. We tried to work something out so I can stay there. They just decided they didn’t want to do it. Q: Are you looking for another location? A: Well, I’ve been looking. But over the last 15 or 20 years — man, it used to be blues clubs all over the city of Chicago. Since they started the DUI, why the guy used to come spend five or six dollars in Robbins or Joliet, man, he’s afraid to drive that now. If you’re not downtown, I don’t think a club’s going to be too successful. I don’t know what’s going to happen. Something may happen, and I wouldn’t say no if I get the opportunity to go in another place. It’s so expensive now to rent a place. People don’t drink that much no more … compared to what it used to be. Q: In the new documentary, you talk about your early days in Chicago, when there were blues clubs and record stores at almost every other door as you walked down the street. A: Yeah, on both sides of the street. 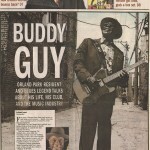 Before I met Junior Wells and Muddy Waters and all those great blues players, I’d go walking. There wasn’t no air conditioning, they had the blues clubs open. And you would think it’s Muddy Waters. You walk in on them and it’s a three- or four-piece band sounding just like him. So I never did make it where I was told to go, because I thought I was missing something if I passed and heard this band playing, on 47th, 43rd, 63rd, Indiana — oh, man, I could go on. You go on the West Side, it was 12th Street, Madison Street. Oh, man. It was 99.9 (percent) all blacks listening to blues in those days. Q: If you go into a blues club now, a lot of white people are listening. We have a few black people come in — not the young ones. Once in a while, one young guy comes around. They’re into the hip-hop. You know, I guess they’re keeping up with it. It was the same when Muddy Waters and them amplified the harmonicas. I guess they was looking at it the same way. Q: What do you think the future is for blues? A: It’s scary. My children are grown, and all of my children didn’t know who in the hell I was until they turned 21 and they came in that club. And all of them cried, my daughters and sons, said, “Dad, I didn’t know you could play like that.” For some reason, they got us hid behind the curtain. We’re not on television, our records don’t blast on the radio like everybody else’s. What you hear on the big AM and FM stations now, it’s nothing but superstars. You turn your radio on, you’re not going to hear nothing but Madonna, Britney Spears, Rod Stewart and people like that. And they give you that rotation over and over. You know, my record never would get in there. It’d be nice to just pop in a Muddy Waters or a Howlin’ Wolf or a T-Bone (Walker) every once in a while, you know? It’s like, I don’t know what your favorite meal is, but if they give it to you every day for six weeks, sooner or later, you’re going to say, “Buddy Guy, bring me some of them red beans and rice. I’m tired of this turkey.” So that’s what time it is now. When we had all the AM stations, you could make a record and take it up to a disc jockey who had the right to play it. Now days, you’ve got program directors that give the disc jockey the records to play, and they’d better not play nothing but what they was told to play. Q: You’re an exuberant performer onstage. Where did you get that from? A: Guitar Slim. I saw him play, and I saw B.B. King. I said, “Well, I would like to sound like B.B. King, but I will always like to act like Guitar Slim, just wild and crazy.” It makes sure someone plays attention to you. I was just putting on a show. Q: Most guitarists played sitting down in those days? A: When I came to Chicago, all of the blues cats was sitting down. That’s what made people pay attention to me. … I just walked out on the bar and started kicking people’s whisky over. They said, “I don’t know who this is, but tip him.” I just jumped off the bar with the 100-feet cord, and somebody thought I joking then. Because, first of all, they say that guitar wouldn’t come through that much long cord, but I saw Slim do it, so I bought me one. Q: There’s a story that your very first guitar was a contraption you made when you were a kid. A: Yeah, a lighter-fluid can, with a little flat board, and I tried to strip all of the screen from my mother’s window and tried to make string. I just tightened it up and picked away at it. Matter of fact, I first was picking away at a rubber band from two nails in the wall before I realized the screen would make a more guitar type of sound. Q: Can you put into words the way you come up with your guitar solos? A: No. I just play whatever comes to my mind, man. A lot of times, I’ll be onstage and I don’t know what the hell I’m going to do myself. I only give you just enough of it to make you love me more. Q: You’ve said that the producers you worked with in your early days discouraged you from playing guitar as wildly as you did in concert. And then British rock musicians like Eric Clapton had hits with similar sounds. A: Right. Leonard Chess (of Chess Records), he sent Willie Dixon to my house. … Willie Dixon said, “Put on a suit, he wants you in his office.” I had never been in his office before. He had found out the British cats were coming in with those guitars ringing, including (Jimi) Hendrix. And he said, “I want to you kick me in my (expletive), because we’re the dumbest (expletive) you’ll ever want to know. You’ve been trying to give us this stuff, and we were too (expletive) dumb to know it would sell, and this is the hottest (expletive) out there. Now, you can come in and make a record and turn the amplifier up.” I was on my way to Vanguard (Records) at that time. Q: Are there songs on the box set that you hadn’t heard in a long time? A: Hadn’t heard in a long time. Actually, I haven’t heard it now, because I’ve got to get the people to send me one. I know I’m going to play my club the whole month of January, and I’m sure somebody’s going to ask me to do a few of them, so I’ve got to rehearse myself on them. Q: Wait a minute — you don’t have a copy of your own box set? A: No. People visit my house, man, they look at me and just take it. I said, “Man, you can’t — that’s my record.” They say, “Well, you just sing it.” I hardly ever do listen to myself, because I can’t learn what I already know.